The purpose of the Bell Tower changed according to the requirements of the era. In general terms the towers were built for accommodation, including prisons, and as gateways protecting the Tower of London concentric castle complex. The concentric castle design ensured protection of the Tower of London with successive lines of fortification - many of the different towers were gradually added, over many hundreds of years, providing additional protection. Specific facts and info about which English King was responsible for building the towers, when the towers were built, the style of architecture and interesting info about its history. Who built the Bell Tower in the great Tower of London in England? 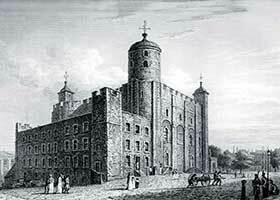 The History of the Tower of London is great, bloody and cruel and the Bell Tower has its part to play in its story. Bell Tower is just one of the 21 towers which, together, form the Tower of London castle complex. The Tower of London covers an area of 18 acres and its magnificent architecture covers almost all the styles which have flourished in England. Although the Tower is no longer a place of great military strength it has in time past been a fortress, a palace, and a prison. This section provides key facts and information about the Bell Tower. The purpose of the Bell Tower was to expand the castle complex area. The bell it contained was rung at times of danger and immediately all drawbridges were raised, portcullises dropped and gates shut. The very walls of the Bell Tower contain some of the bloody secrets and the of the history of the Tower of London. Which King was responsible for building the Bell Tower and what was his reason? When was it built? Interesting facts and info about the history of the Tower of London!